If you need to upgrade your mattress to something comfier but don’t have the money for a new mattress you’re in luck. 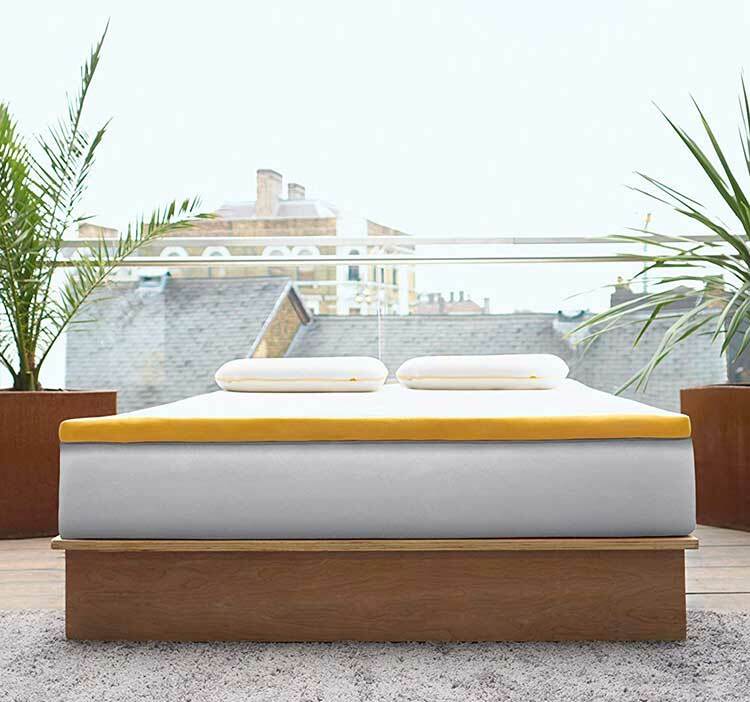 The Eve mattress topper provides a comfortable nights sleep on top of a topper that doesn’t overheat you, keeps you still through the night and lets you wake up in the morning well rested and refreshed. All that without breaking the bank. Sound good? You bet it does, so let’s dive into this review of the Eve mattress topper and see if it’s right for you. Memory foam has a lot going for it, it’s one of the most popular types of mattress and has been keeping people across the UK sleeping soundly for decades. If you’re prone to back problems or tend to wake up in the morning stiff and even in pain then you’re in luck, the Eve topper moulds to your body while you sleep which gives you the support you need where you need it. The way memory foam hugs you stops you from getting so restless through the night as well, it stops you from rolling around and disturbing your sleep letting wake up rested. This has the double bonus of absorbing movement so that when your partner moves around you won’t feel it and will stay asleep. I like how much thought has gone into the Eve mattress topper, they’ve carefully constructed it in 3 different parts that each work to give you the best sleep possible. 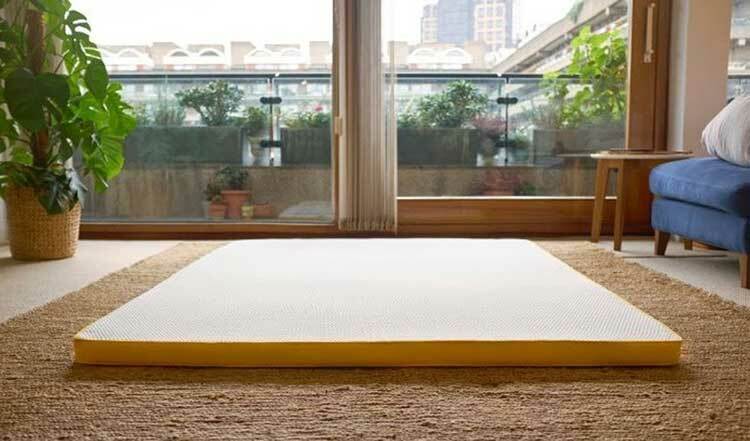 Let’s start at the bottom with the 3 cm of ultra-resilient reflex base foam, this works to cover up and lumps or sags your old mattress might have had while also giving a firmer base for the supportive foam that goes on top. The whole thing has a medium-firm feel so can be a great way to firm up a soft mattress. This is the special ingredient that’s inside it which gives it it’s breathability and support. The support comes from it being memory foam but what’s clever is they made this foam to be 30x more breathable than traditional memory foam which could over heat you. This means the Eve mattress topper can help breathe out all the heat that you generate when you sleep keeping you comfortable without making you cold. If you’re prone to really bad overheating then you’ll want a more natural mattress topper but most people will get on great with this one. The Cover is hypoallergenic so if like me your an asthma sufferer this is a big plus but even if you’re not it helps to keep germs and dust mites out of your bed which can make you sick. It’s 100% polyester and the top part can be machine washed at 40 c which is handy in case anything gets spilled on it. Underneath that is a non-slip base layer that alongside some corner straps keep it in place nicely. I hate when the mattress topper slips down the bed because it’s a nightmare to pull back up again so this is a really big plus for me. One thing I really like is that you actually get a 30-day trial period and if you’re not happy with it, you can send it back for a full refund. Plus it’s an actual refund, you don’t have to pay for return shipping, just phone up they collect it and you get your money back, so you might as well try it since if it doesn’t work out you can get your money back. After that, you have a nice 3-year guarantee so no worries there. Oh, and it’s free delivery! The sizes you can get are all the standard bed sizes, what’s good is they’ve got UK and EU sizes so if you have an ikea mattress you can still get the right size. There is a good chance that when your first open your topper up you’re going to get a really weird chemically smell. That’s TOTALLY NORMAL, just an unfortunate side effect of memory foam. You simply need to leave it unwrapped and out from under the sheets for a while with the windows open and the smell will go away. The Eve Mattress topper is a really great way to upgrade your bed whether you’re looking for comfort, support or cooling. An ideal way to improve any mattress. 16st (for context) and I have a (perhaps too) firm Vi-Spring mattress. I need more ‘sink’ I think; more *distributed* support. eg. when on my back most of my leg weight seems to be on my heels. The back of knee seems to have nothing supporting it. I’ve tried pure/single layer memory foam mattress in the past – they were not comfortable, got hot and gave me back ache. Yes, I think the Eve mattress topper will do a great job for you. And you get a 30-day trial so if you don’t like it you can arrange to get it sent back. am interested in how the mattress topper has helped you? i too have a vi-spring mattress firm tension, have been experiencing lower back pain. It has a 3-year guarantee but I would say that’s a minimum life expectancy and you’ll easily get a few more years out on top of that before you notice any sag or it becoming a bit softer. Even then, it’s a topper and not the mattress so you won’t start to get back pain or anything like that, it just won’t be as comfortable as when you bought it, but still a lot more comfortable than just the mattress!